Stein has already filed in Wisconsin, where a statewide hand recount is expected to start near the end of the week. 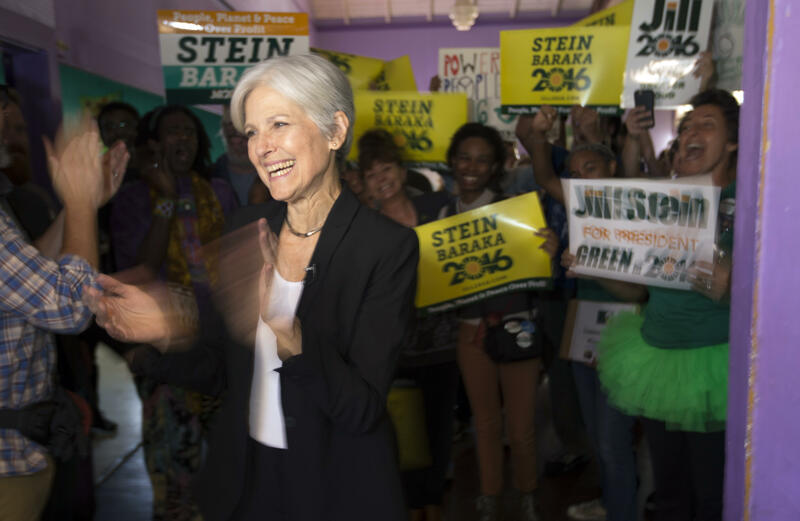 But of the three states in which Green Party presidential candidate Jill Stein is pursuing recounts, Pennsylvania may have the highest hurdles to a recount. For one, it’s the only state in which candidates can’t file direct requests -- they can only file a legal appeal that would be decided by the court. Her Bucks County lawyer filed the legal appeal in the Commonwealth Court of Pennsylvania Monday. Stein and the Green Party are joining a voter-initiated recount in Pennsylvania. Stein has come up with the $500,000 she needs for this effort, but as it turns out, that was the easy part. In Pennsylvania, a statewide recount can occur if at least three voters per precinct or election district submit affadavits. There were some 9,175 election districts in Pennsylvania as of June, 2015, according to Citizens for Election Integrity (CEI), a group which advocates for accuracy in elections. In her video, Stein makes a plea for volunteers from each district to file these affadavits, and she walks through the steps necessary to file the paperwork. There’s downloading the affadavit from her website, and filling it out -- did you vote on an optical scanner or electronic touchscreen, she asks, explaining the difference between the two machines. After all of this, she warns the volunteer voters not to sign their affadavits until they’re in the presence of a notary public. And afterwards, they’ll have to submit their affadavits to the clerk in their individual election districts. That’s not all -- the deadline varies from district to district, Stein notes in her video. It could be Monday or it could be Tuesday, Stein says, and in some districts, “the deadline has already passed.” As she talks through all the steps, it’s evident that she knows that she’s asking for a lot, and the odds are long for a statewide recount -- over 27,000 individual voters in these precincts in every corner of Pennsylvania would have to follow these instructions perfectly, notwithstanding the districts where the deadline has already come and gone (but there aren’t many of those, she said). There would have been an automatic recount triggered in Pennsylvania if the margin of victory had been 0.5 percent or less. In fact, though, in the three states in which Stein is pursuing recounts, Donald Trump had the largest margin of victory in Pennsylvania -- 70,638 votes (a 1.17-percentage-point difference) -- according to the results published by Pennsylvania’s secretary of state. President-Elect Trump tweeted on the topic several times over the weekend -- he called the recount efforts “sad” and declared that “nothing will change” despite the time and money that will be spent. If Stein does succeed in getting a recount in Pennsylvania, it may resemble the one undertaken in 2004 in Ohio, initiated by the Green Party. The New York Times noted at the time that the statewide recount of Ohio’s 88 counties resulted in a net difference of 285 votes, meaning that George W. Bush beat John Kerry in Ohio by 118,457 votes, instead of 118,775. The recount concluded on Dec. 28, 2004, nearly two months after the election took place. CBS News’ Steve Chaggaris contributed to this report.